Reid Park Zoo is teaming up with the Confucius Institute at the University of Arizona, Tianyu Arts & Culture Inc. and Tucson Chinese Cultural Center to bring more than 40 amazing lantern displays, authentic Asian cuisine, Chinese name writing, calligraphy, painting, music, crafts and more to Tucson. When: Every day, Feb. 2 to March 23, 6-10 p.m. Cost: $18 adults, $16 ages 2-14, 1-year-old or younger are free. Members get $2 off. Bring your seeds and plants to swap and the librarians will help your kids craft a paper pot to plant their seeds. The Bean Tree Farm and Arizona Homemade Artisans will be demonstrating some delicious uses for native desert plants too. Where: Seed Library of Pima County Public Library, 101 N. Stone Ave. When: Saturday, Feb. 9, 2-4 p.m. Experiencing difficulties at school, home or work can be frustrating, especially when you don't understand the cause or how to solve the problem. Click here to see the full list and make an appointment today. Enjoy a free, family-friendly, daylong festival. The festival features live music, craft beer, food trucks, vendor booths, make-and-take bead stringing projects, shopping and more. Where: Beads of Courage, 3230 N. Dodge Blvd. When: Saturday, Feb. 9, noon to 9 p.m. This fun 5K challenge will be held at the training academy for Southern Arizona police and firefighters. This run/walk is a mix of running and fitness challenges. There will be music, vendors, prizes, raffles and static displays from first responder departments. Warm up your valentine with some free chili tastings until 11 a.m. Attendees get to judge the best flavor, hottest and most unique chili. Plus, shop bikesa, jewelry and wallets. When: Saturday, Feb. 9, 9 a.m. to 4 p.m. Cost: Free to attend but, bring some money if you feel like shopping. Enjoy the gem show KAT-club style. Get ready for some aerial arts, a dance showcase, a visual-arts opening, live music, food and beverages. Friends and family are welcome to get dressed in their favorite animal attire for the event. Where: Kinetic Arts, 17 E. Toole Ave. When: Saturday, Feb. 9, 6-10 p.m.
Take your friends and family for a treat with some after-dark discovery. Bring your flashlights and encounter some live reptiles and insects, watch fun movies and make glow-in-the-dark crafts. Cost: $10, $5 ages 4-12, ages 3 and under are free. On the first Thursday of every month, the Tucson Museum of Art is free and open to the public. Enjoy live music, performances, art-making, unique gallery experiences and more. When: Thursday, Feb. 7, 5–8 p.m.
Find more information on dates and times here. Get your strollers ready! Take a 2-mile aerobic walk with your littles, meet other moms and have fun. Little exercise and yoga breaks will be taken along the way. When: Saturday, Feb. 9, 9 a.m. When: Saturday, Feb. 9, 1-4 p.m.
Amber Norgaard Trio will be singing and strumming at the ranch. The event features live music, outdoor market and activities for the kids. When: Saturday, Feb. 9, 10:30–12 p.m. Create family projects like mandalas, scratchboard art and puppets at TMA. After your family fun, stay and enjoy a performance by The Dusty Ramblers Project. When: Sunday, Feb. 10, 10 a.m. to 5 p.m. Cost: Activities are free, admission to the museum is also free this day. Valentines, broken hearts and heartbreakers are welcome to a fun run, mimosas, free egg/potato breakfast, costume contests, exchange zone, UA stadium ramps and a group challenge to win prizes. Where: Main Gate Square, 814 E. University Blvd. When: Sunday, Feb. 10, 8:30-11:30 a.m. Cost: Free, capped at 750 registrants. It's the annual cover dog search! Here's your chance to make your furry friend famous. Join HSSA and Tucson Lifestyle Magazine and get your dog's picture taken, enjoy shopping and talking with pet vendors. All registered dogs will receive a mock-cover of the magazine to display proudly in their homes. The winner will be treated to a personal photo shoot that will be featured on the cover of the May 2019 edition of the Tucson Lifestyle Magazine. When: Saturday, Feb. 9, 9:30 a.m. to 2:30 p.m. Cost: $30-$50, get your tickets here. Dogtopia is teaming up with Mature Mutts at PACC and Tucson Rescue Now at this fun adoption event. For each senior pet adopted, Dogtopia is giving away five free days of daycare. There will also be a prize wheel, swag and free food on the grill (while supplies last). When: Saturday, Feb. 9, 11 a.m. to 2 p.m. Cost: Free to attend, but bring some money in case you fall in love with a senior pup. Enjoy an outdoor event with raffles, painting, corn hole, giant jenga, ping pong, food and beer — $1 per beer will be donated to Pima Paws for Life. Blacktop Grill will be serving Sonoran dogs. When: Saturday, Feb. 9, 2-5 p.m. Cost: Event is free to attend, but bring some money for tasty treats. The furry/feathered friends at Therapeutic Ranch for Animals and Kids are waiting for kids to come visit them this weekend. This is a great opportunity for kids that are lacking the self confidence to read aloud in class and socialize. Kids are welcome to choose a book from TRAK's collection or bring their favorite book from home. When: Sunday, Feb. 10, 4:30-5:30 p.m. Discover and buy treasures from over 4,000 trade companies from all over the world. Gems, minerals, fossils and other items will be on display to dazzle you (and your wallet). Find a very thorough guide for locals here. Madagascar Minerals Gem Show, Norcross-Madagascar Gallery, 201 W. Lester St., Jan. 21 to Feb. 22. Granada Gallery, Granada Gallery House, 338 N. Granada Ave., Jan. 24 to Feb. 16. Executive Inn Fossil, Mineral & Gems Show, Fortuna Inn Suites, 333 W. Drachman, Jan. 24 to Feb. 11. American Indian Arts Exposition, Quality Inn, 1300 N. Stone Ave., Jan. 27 to Feb. 10. Arizona Independent Warehouse Show, Wholesale Warehouse Building, 1500 E. Apache Park Place, Jan. 27 to Feb. 17. 1801 Oracle Mineral, Gem & Fossil Show, Sun Gemstone, LLC, 1801 N. Oracle Road, Jan. 28 to Feb. 18. 1820 Oracle Wholesale Show, Top-Gem Minerals buildings, 1835 - 1893 N. 11th Ave., Jan. 30 to Feb. 17. Kent’s Jewelry, Lapidary, Tool & Supply Show, Kent’s Tools, 2745 N. First Ave., Jan. 30 to Feb. 18. 22nd Street Show, 22nd Street Show, 600 W. 22nd St., Jan. 31 to Feb. 17. JOGS Tucson Gem & Jewelry Show Tucson Expo Center, 3750 E. Irvington Rd., Jan. 31 to Feb., 11. Kino Gem & Mineral Show, Kino Sports Complex, 2500 E. Ajo Way, Jan. 31 to Feb. 17. Gem & Jewelry Show on Grant, Grand Luxe Hotel (formerly Grant Inn), 1365 W. Grant Road, Jan. 31 to Feb. 12. 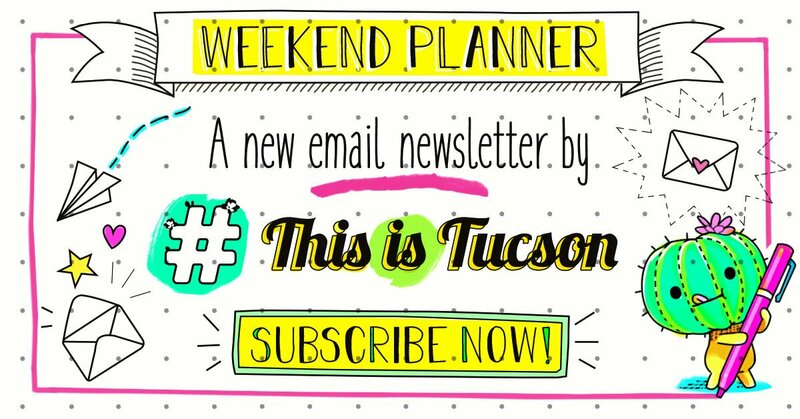 Tucson’s Hidden Gem Show, The Warehouse on North Main (formerly the Samora Minerals warehouse), 707 N. Main Ave., Jan. 31 to Feb. 14. Check out Tucson's only all glass art and supply show. The show features lamp-worked beads, jewelry, glass art tools and supplies and don't forget to check out some classes while you're there. Where: 633 W. 18th St.
Wednesday and Thursday, Feb. 6-7, 10 a.m. to 6 p.m.
Friday, Feb. 8, 10 a.m. to 9:45 p.m.
Saturday, Feb. 9, 10 a.m. to 5 p.m. The flea market is back up and running with tons of vintage, antiques and other collectibles for you to shop. When: Sunday, Feb. 10, 8 a.m. to 2 p.m. Cost: Event is free to attend, but bring some cash for shopping. Sip, learn and create with the Creative Juice crew. This workshop will give you the tools to create a memorable sign to hang on your door or to give your valentine. When: Wednesday, Feb. 6, 6:30-8:30 p.m. Cost: $29, get your tickets here. Bring your mat and sweat with a pint of beer. Where: Crooked Tooth Brewing Co., 228 E. Sixth St. When: Saturday, Feb. 9, 10:30-11:30 a.m. Cost: $5, includes 1 beer. Watch a classic family-friendly film with your favorite furry friend, Paddington. Pre-show activities hosted by Mildred & Dildred Toy Store starting at 9:15 a.m. When: Saturday, Feb. 9, 10-11:45 a.m.
Take your sweetie to watch two versions of a classic romantic comedy at the film bar. Don't forget your free popcorn! When: Friday, Feb. 8, 7-10 p.m.
Cowabunga! See the heroes in a half-shell and order some turtletastic pizza from Fresco's. Bring your pizza receipt to the video counter and you can get a free rental. When: Saturday, Feb. 9, 7-9 p.m.